I’ve found many Lightroom users simple ignore the Auto Tone button and most probably never use at it all, but it’s a button I almost inevitably try first before making any of my own adjustments. I like to see what changes Lightroom suggests and more often than not it makes a much improved starting point from where I can commence to make my own adjustments rather than the defaults. 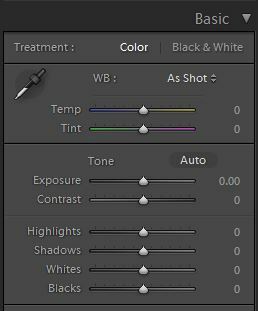 Auto Tone doesn’t work all the time though, especially if you have a high key image such as a snow scene for example, but in general I think it’s always worth a click to see if it improves things. Sometimes you may just surprised how well it does adjust your image. When you click on the Auto Tone button you will observe the sliders within the Tone section move. If you don’t like what you see, you can simply undo the changes with CTRL-Z, or you can reset each parameter individually by double-clicking on the slider name. However what you perhaps won’t realise is that you can Auto set each parameter individually as well. This is achieved by using Shift-double-click on the parameter name. So if you wish to automatically set just the Black point, place your mouse pointer on the Blacks, hold down the shift key and double-click with your mouse. You could for example Auto set your clipping points, then just Exposure and Contrast manually. It’s not a feature that will probably see a great deal of use, but you never know it may just come in handy on day.